On behalf of the Seattle Transit Blog (STB), I would like to welcome the American Planning Association to Seattle for its four day national planning conference. STB has covered transportation and land use policy in the Puget Sound region since 2007, becoming a recognized source of transportation reporting and advocacy. Written by a group of passionate advocates, we dive deep beyond the headlines. 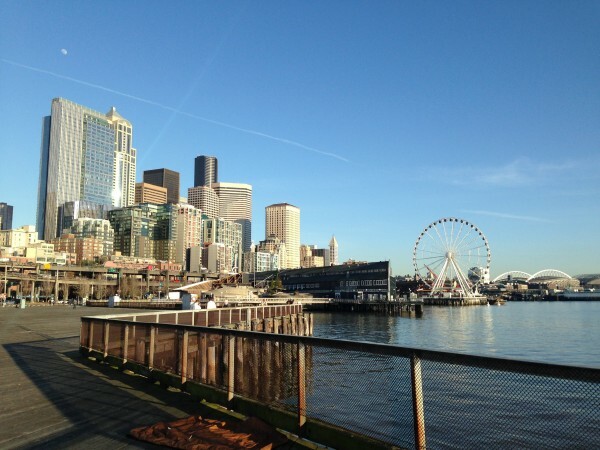 To help APA attendees from across the country get oriented in our fine city I’ve pulled together a topical compilation of posts and links which will help you get up to speed on the what’s happening in Seattle. If you want information about getting around the city check out Seattle for visitors or consider using our bike share system called Pronto! If you have questions leave a comment and our awesome readers will help answer your questions. 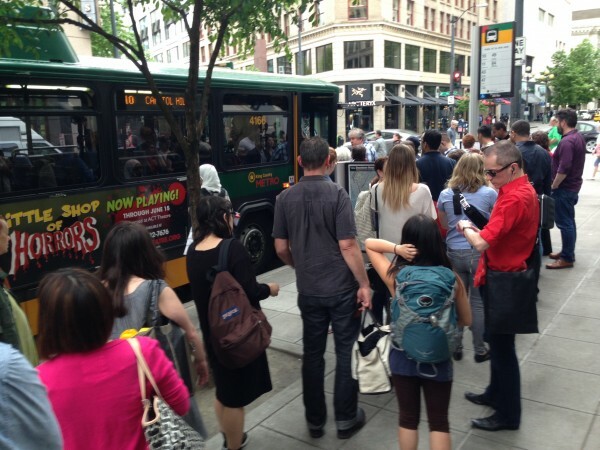 Seattle recently implemented a regional low-income transit pass. Here’s why we support it, how it was studied and how it was rolled out. Don’t forget about Seattle’s $15 dollar minimum wage. Housing affordability in the nation’s fastest growing city has becoming an omnipresent issue, especially in Center City neighborhoods like Capitol Hill. 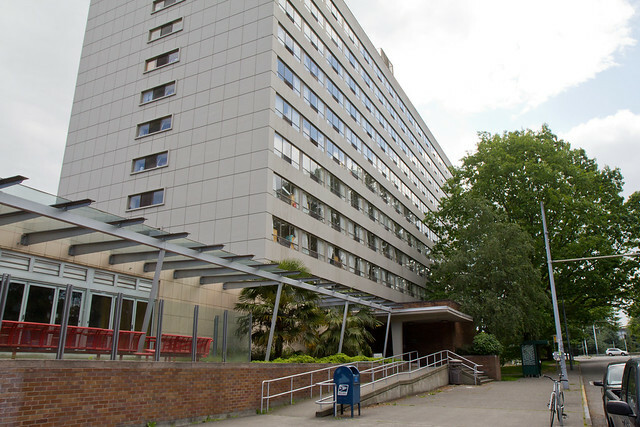 The Mayor has set up a committee and has called for 50,000 new housing units (20,000 affordable) in the next 10 years. Recently the City Council “went a little to far” on micro housing regulations which some have opposed. Link Light Rail is expanding north to Lynnwood, south to Federal Way and east to Bellevue and Redmond (despite years of lawsuits). The region could vote to expand regional high capacity transit as soon at 2016 but first the State Legislature has to expand Sound Transit’s funding authority. Seattle is a national leader on performance based on-street parking management. However, off-street parking regulations which were eased years ago have recently been thrown into a state of limbo. In Downtown thousands of off-street spaces go unused every day and the Mayor has proposed some innovative ideas for moving forward. Seattle has a complicated relationship with Bus Rapid Transit (BRT). For example there are insincere BRT “supporters”. 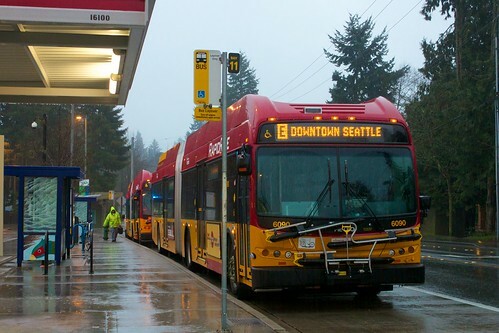 Metro’s RapidRide BRT wouldn’t likely get federal funding now because it’s too watered down. Madison Street is poised to get the City’s first true BRT. Seattle would like to connect the First Hill Streetcar to the South Lake Union (SLU) Streetcar with an alignment operating in exclusive lanes along 1st Avenue in Downtown. Seattle would also like add a transit only lane on Westlake Avenue to get the SLU Streetcar and buses out of traffic. Seattle is tearing down the waterfront viaduct, but the largest tunneling machine in the world is having issues. We would have loved the Surface + Transit solution but the questions now is what should the waterfront look like? Parks or commerce? Grand or understated? Seattle has the largest Car2Go fleet in North America and it’s expanding. How does Car2Go compare to Zipcar? Why does it work so well with paid parking? We sit down and talk with Car2Go’s CEO. How do you integrate bus and rail service? Mt. Baker Station is bad example, which might get better. 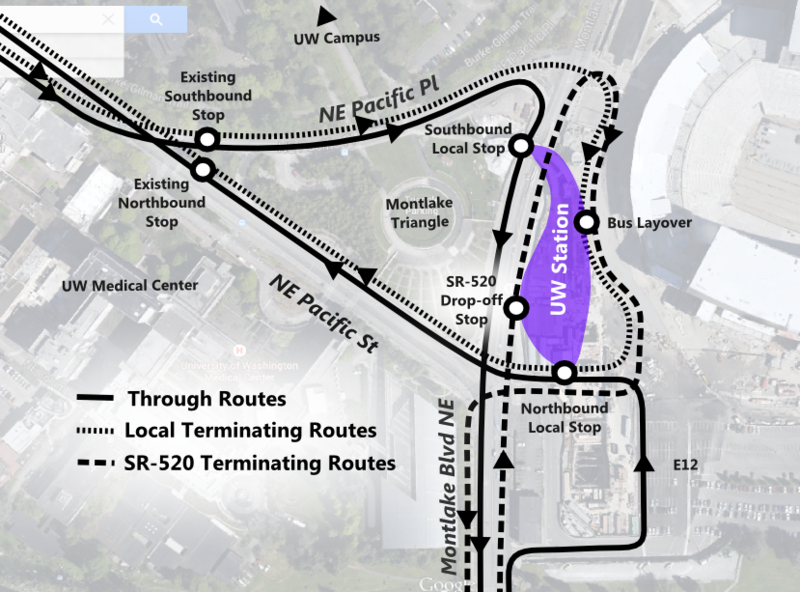 Metro and Sound Transit are looking at how to restructure bus service when University Link opens in 2016 but transfers at UW Station will be far from ideal. South Lake Union, home of Amazon, is booming, but transit service is having a hard time keeping up despite planning. What’s Your Vision for Metro’s Future? The discussion from each break-out sessions will then be used to identify common themes and the overall vision of where participants want Metro to be in 25 years. 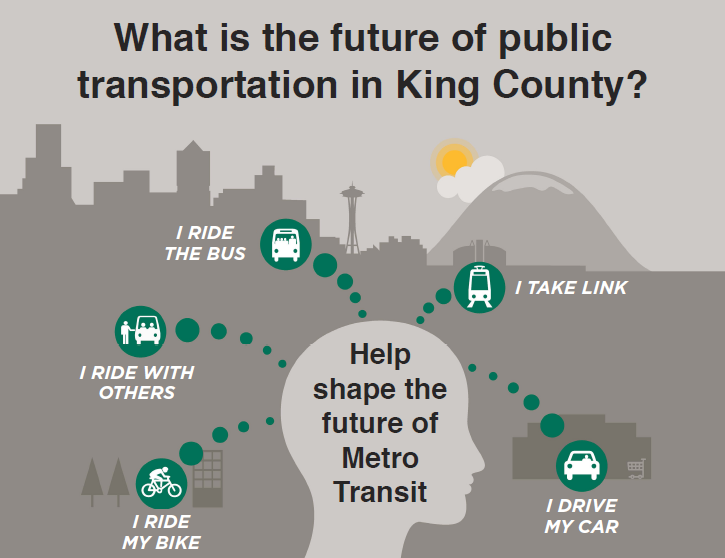 If you care about the big picture vision of transit in King County this event is a must. Once break-out sessions have wrapped up the event will transition directly into the panel discussion guided by the themes and vision generated in the break-out sessions. Panelist include Jarrett Walker (transit planner extraordinaire), Rebecca Saldaña (Executive Director of Puget Sound Sage) and Mark Hallenbeck (UW transportation researcher and BIG picture thinker). This discussion will be moderated by Rita Brogan of the Washington State Transportation Commission. This promises to be a unique, blue-sky type of event that only happens a few times a year and I would strongly encourage those who are interested to attend. More details are available here. Last week, Mayor Murray launched the City of Seattle Vision Zero Plan, adding Seattle to a fast-growing list of US cities that have committed to reducing preventable road fatalities to zero. The plan, which was covered here, here and here outlines a variety of near-term actions the City will take to eliminate road deaths and serious injuries by 2030. The City’s plan, which builds upon Washington State’s Target Zero program, was modeled after Sweden’s Vision Zero programs which began in the 1990s. While Washington State’s road fatality rates are roughly twice those of Sweden, the state has made good progress, with fatality rates dropping by 40% since 2000. Seattle’s Vision Zero Plan is an excellent starting point. It identifies high-value, near-term actions the City can take now to improve road safety, especially for pedestrians and cyclists, who are the most vulnerable road users. 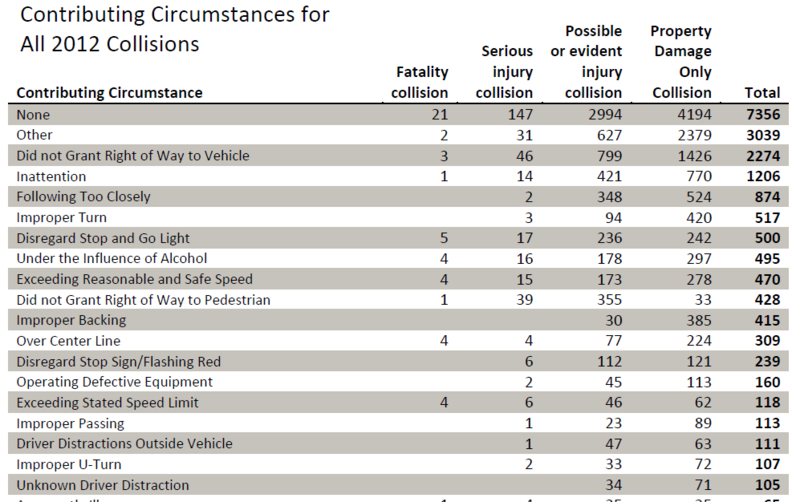 Unfortunately, the level of detail identified by the plan for road improvements didn’t carry over into strategies and actions for reducing impaired driving. Yesterday the Sound Transit (ST) Board met to review the Long Range Plan (LRP) update, including discussion of the existing LRP text and corridors. As a reminder, the LRP represents the fiscally unconstrained vision of the Sound Transit system, selections from which will be used to develop a Sound Transit 3 (ST3) ballot measure. This workshop (materials available here) was a check-in on the LRP process that began nearly a year and a half ago when the board decided to accelerate ST3 planning for a potential 2016 ballot measure. Over the next two months, the ST Board will finalize the updated LRP, which will then be used to develop ST3 investment scenarios which would emphasize investment priorities such as completing the “spine” or maximizing system integration. Staff began the meeting by presenting a “Chair’s Mark-ups” of the 2005 LRP text. Staff updated the text to begin the discussion and reflect some of the changes that have occurred since the plan was adopted in 2005. These changes included adding recent board policy decisions concerning station access and transit-oriented development. It also included updated definitions of bus rapid transit (BRT), including grade-separated busways and bus-only lanes. Staff also attempted to “tighten” the goal language to reduce repetition. Finally, staff presented a high-level overview of the light rail, high capacity transit, bus rapid transit, express bus and commuter rail projects identified by the public as part of the plan update. Councilmember Roberts asked that text around system integration be added to reflect the integration work currently underway between Sound Transit and Metro. Secretary Peterson said that WSDOT should play a larger role, that there need to be better integration of long-term land use planning with LRP corridors and that Sound Transit’s projects need to support local land use decisions. Another member wanted to add citizens’ health to the goals, but was unsure how to measure it. The workshop maps show the new rail and HCT corridors that came out of the public process. There aren’t many of them because the existing LRP is already extensive. The biggest addition is West Seattle-Downtown light rail, formerly a monorail corridor. The map below shows the existing long-range corridors in gray, and the new corridors in bright colors and numbers. In some cases rail and BRT corridors overlap; e.g., Renton-Kent-Puyallup has both an LRT corridor (#7) and a BRT corridor (#33). Only one would be built, but the plan has both options. The BRT corridor continues to downtown Seattle, basically a variation of the 578. But BRT implies more than ST Express: it means frequent service and transit lanes. The South Park Bridge opens on June 30th with the route 60 returning to its original routing. Seattle isn’t the only city that is growing faster than its suburbs. Erica Barnett reports on the visceral and not-so-disguised disdain of micro-housing renter by some who oppose micro-housing projects. 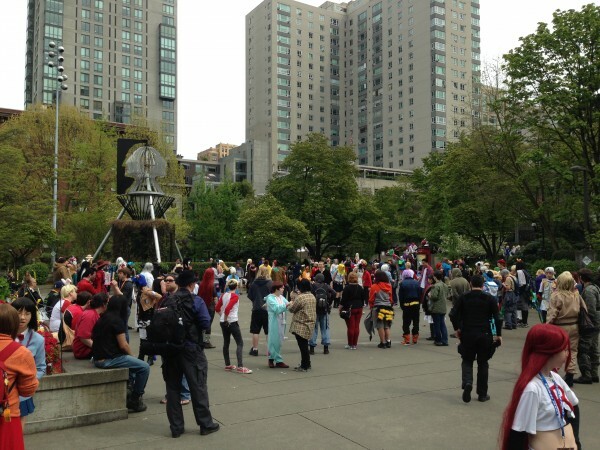 The Stranger sure had a few words for Mayor Murray last week. Let’s not forget the failure of the monorail and the approach that some booster took. Sound Transit and Metro present various options for bus/rail service integration to the Mercer Island Council. This right here is how you plan for an integrated regional transit system. More details here. Translink develops an app to discretely report non-emergency issues to their Transit Police. Some people worry about loss of parking from the First Hill Streetcar extension to Roy/Aloha. I worry more about ensuring that 8-80 bicycle facilities are included. The Highway Trust Fund is quickly approaching bankruptcy, with the Obama administration opposes a federal gas tax increase. We’ll see where this goes over the summer. Only in the US would carjackers not know how to drive a manual transmission car. Fred Hutch builds a new skybridge and stair-climb between Fairview and Eastlake with a runnel. There is now a new way to get to the Tukwila Sounder station from Renton. Chris Karnes wants to see a Tacoma Link connection to Tacoma Community College added to Sound Transit’s Long Range Plan. Hey whatever happened to the Civic Square project? Let’s hope someone has a plan. The gondola to Simon Fraser University in Vancouver didn’t make the region’s wish list but advocates are still pushing for it. The partially completed Evergreen Point Freeway Station opened Monday. An eastbound half-mile bus-only lane is providing some relief for riders. Another massive backup on I-5, this time due to a knife wielding man on the Ship Canal Bridge. I look forward to the reliability and redundancy that Link will provide in the not so distant future. Kate Joncas, the CEO of the Downtown Seattle Association, will become the deputy mayor of operations for the City. The Seattle Bike Blog has some great analysis of biking trends using data from the Fremont Bridge. Yesterday’s rainfall is almost as important as today’s rainfall when estimating daily bicycle volumes. 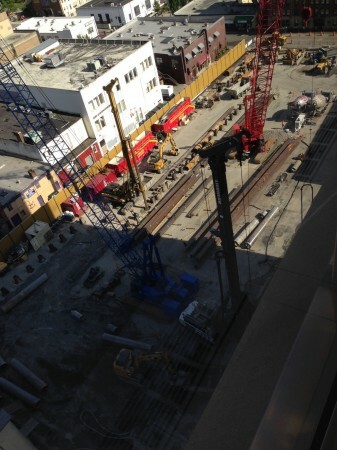 Bertha is beefing up to better deal with tunneling conditions. Mayor Murray continues his impressive winning streak, removing caps on TNCs while evening the playing field. Let’s hope that he can keep up this kind of progress on the regional and state level. The Washington Transportation Commission is looking more seriously at road-usage charges with three tiers. Implementation has always been the sticking point on this idea, and the three tier approach sound fairly implementable to me. SDOT will construct more neighborhood greenways this summer. A debrief on the First Hill Streetcar extension open house. Washington Sate is required to cut CO2 emission by 72% according to the recently released EPA plan, the largest of any state, primarily because we emit so little CO2 to start with compared to other states. Seattle City Light is already 100% carbon neutral. Seattle Bike Blog begins a series on Pronto! Is Seattle too hilly for a bike share system? My bikeability analysis from over four years ago completely concurs with PSBS Executive Director Holly Houser’s answer. PSU releases a major academic study of cycle tracks in the US. I needed a little lite reading for the weekend. Bike Portland wonders if it matters whether or not politicians bike. Mayor Murray still negotiating with rideshare companies. Expect news sometime in the next week? Decades old I-5 expansion joint fails, snarling traffic through Seattle. Part of Broad Street closes permanently. I for one will not miss its horrible 4ft sidewalks. Details of the waterfront stair-climb along Union Street released. This has long been my favorite connection because of the amazing views of Puget Sound, despite the 2nd rate pedestrian realm. More seating please! Sounds like Bellevue will pass on trying to save its Metro bus service. The summer roadwork seasons will be especially busy this year. Ballard to 15th Ave Race: Who will win; bike, bus, cab, rideshare, carshare or the private car? I can think of a few things that would radically change this outcome. The City of Redmond is looking for a transportation planning and engineering intern. SDOT is looking for six(!) traffic operations interns. SDOT is close to finishing the Belltown-Uptown trolley electrification project. Metro has finally completed the Southend Pathway study. The winner is a two-way Columbia Street design, Option 2 or 2B. Six project ($) win the PSRC Vision 2040 award. The Capitol Hill Champion meets with 8/9 developers to discuss what the community want to see at the Sound Transit Capitol Hill TOD site. Seattlish calls it as it is. Microhousing opponents are “concern-trolling“. Mike O’Brien will convene a stakeholder committee on microhousing legislation. Interactive map shows the average age of buildings in Seattle. Google unveils its own driverless car prototype. More importantly, what does this move say about the path, business model and eventual role of a driverless car future? Is it worse that I ignored a PR email we got about this “solar roadway” business as a late April fools joke, or that they raised $1.5 million in crowdsource funding? Seattle is the fastest growing big city in the US. Remember this is a good thing. For the first time in 100 years Seattle is growing faster than the suburbs. Amazon is the poster child of the tech sector’s return to the city. Joel Connelly argues for more diversity on the Seattle City Council in the name of pragmatism. We’ll see what district elections do on that front. Portland food-cart pods on private parking lots are getting displaced($) due to new development on those parking lots. Meanwhile Seattle’s food-cart scene is in my opinion still struggling. I honestly wonder why? The Downtown Seattle Association’s Jon Scholes argues against development fees and an employer head tax to save Metro service. Kevin Desmond, King County Metro’s general manager, thinks any long-term funding solution for Metro needs to be regional. A new report, Older, Smaller, Better, put some numbers behind the ideas espoused by Jane Jacobs, which I believe are generally well accepted. My question is do the finding of this report provide transferable lessons to areas without the historic building stock, and if so how? Eight finalist developers identified for the Capitol Hill light rail station TOD project. King Street Station has room for several office and retail tenants. Seattle Department of Transportation is adding 5 speed-enforcement cameras near schools. Man faces more than 16 years in jail after stealing 4.3 miles of copper wire, the largest in state history, from Sound Transit Link’s light rail system. Here’s our original report. Massimo Vignelli, a seminal figure in minimal graphic design including the MTA’s 1972 subway map, dies at the age of 83. The Department of Planning and Development is presenting three U-District land use scenarios for environmental impact study. Neither Lynnwood nor Bellevue are happy about the siting of a potential Link O&M facilities near them. Tacoma’s Business Improvement Association has offered to pay to keep Tacoma Link free. King County Executive Dow Constantine steps into the ride-share debate; his simple approach is in stark contrast to the Seattle City Council. The Seattle Council passes restrictions on small-lot single-family houses that will limit building height to 18 ft, or the average height of houses on the block, whichever is higher. As of late, it’s been interesting to watch Tim Burgess emerge as a pragmatic and nuanced policy maker. Apartment-to-house construction ratio reaching record highs. Land-use restrictions limit opportunity, but Reihan Salam points out one way to get current residents to buy in. I believe that this idea would, of course, be illegal in Washington, as most constructive and innovative policies are. Greyhound has officially moved to S Royal Brougham Way and 4th Ave.
A great long-form story on the development of Google’s self-driving car. Google maps route planning for bikes now has shows you elevation change! The Fremont Bridge smashes its previous bike count record, topping out at over 6,000 bikes a day. If you support bike helmet laws, you should also support them for motorists and pedestrians. A painfully eloquent microcosm of transit reporting: TV reporter focus on government spending that (wink wink, nudge nudge) might not be worth it, public misunderstanding of the value of bus speed and reliability projects, and then the dry and rushed validation of why the project has merit. Cognitive dissonance takes over at the Seattle Times editorial board. The editorial board is concerned that a PSE transmission lines on the Eastside Rail Corridor might preclude rail in the future. The Muni League would like to set the record straight on Prop 1. If I were them I’d just ask the Seattle Times to issue a correction. Mayor Murray goes full-steam ahead on a 2nd Ave protected bike lane, no committees or consensus building here… kind of… in my opinion he’s actually catching up to the consensus. The University of Washington and Sound Transit finalize a $43 million deal to mitigate vibrations and electromagnetic interference from Link. Disagreement about Sounder station access shows an interesting dynamic with commuter service through historic town centers. A Sound Transit driver could face charges for a fatal crash in Totem Lake last year. Why transit means so much for the business community. My guess is the Mayor will have a lot of takers on the $3 million set aside for the regional partnership funding in his Metro Plan E.
The West Antarctic ice sheet is in irreparable decline and could contribute to sea-level rise of up to 12 feet. SR-99 tunnel workers have worked 3.25 million hours without a serious injury. Mayor Murray wants a “war room” to deal with traffic. Houston is looking at overhauling its bus network. The plan would increase the number of people and jobs within 1/2 mile of frequent service by 111% and 55% respectively without any additional revenue. Last month the world hit the milestone of 400 parts per million of CO2 in our atmosphere with no sign of slowing down. Real estate investment in U-District taking off for the first time in decades, largely because of Link. Sound Transit’s tunnel boring machine named Brenda dedication ceremony for launched her third trip. STP asks for $190 million dollars, WSDOT Secretary Peterson says tax payers are clearly not on the hook. 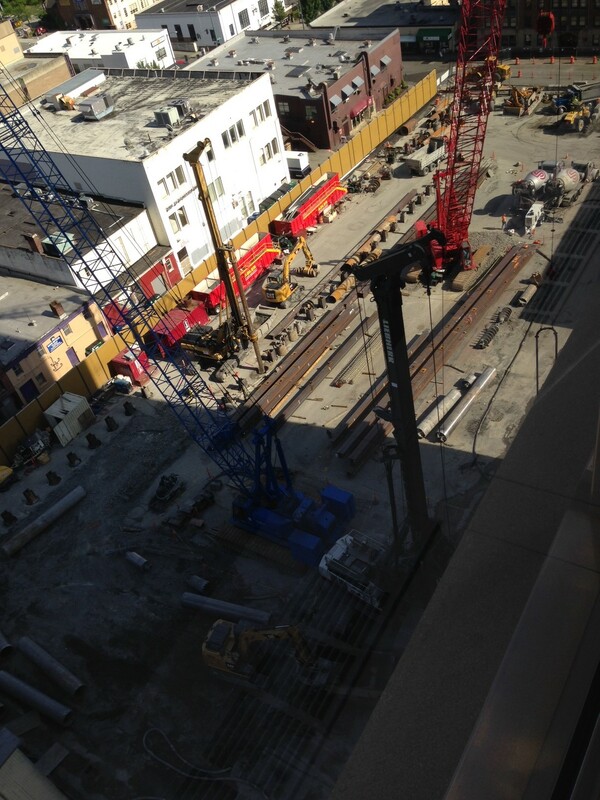 Tunneling will certainly not finish on time and maybe never? Governor Inslee signs executive order to create a Carbon Emissions Reduction Task Force, we’ll see if anything actually gets done. Danny Westneat argues Prop 1’s negative focus didn’t inspire voters, included dead weight (roads), and should have stayed away from car tabs. Goldy argues Prop 1’s failure shows the hostage (Metro non-councilmanic MVET option) is dead, next ask has to be more. Roughly half of Metro’s cuts do not meet Metro’s service planning criteria and performance measures. Sound Transit surplus property near Othello Station will be developed with affordable housing, 2/3rds of it consisting of 2- and 3-bedroom units. Fourteen developers vying for Sound Transit’s Capitol Hill Station surplus property. Developer to be selected over the next month. King Street Station restoration recognized. It really does look beautiful. The Mercer West two-way transition is about to begin! This doesn’t happen every day. Repairs to Bertha will take at least a year to complete. Can we please confirm that Seattle isn’t responsible for cost overruns and ensure that Seattle Tunnel Partners has the financial means to finish? The full council approves the West Seattle Whole Food alley vacation, ending a messy, confused and misplaced fight. Hedreen hedges bet on its alley vacation contingent, 1,600 room hotel. Backup plan is smaller, with no affordable housing, no public art, and in my opinion an inferior street-level design and circulation plan. 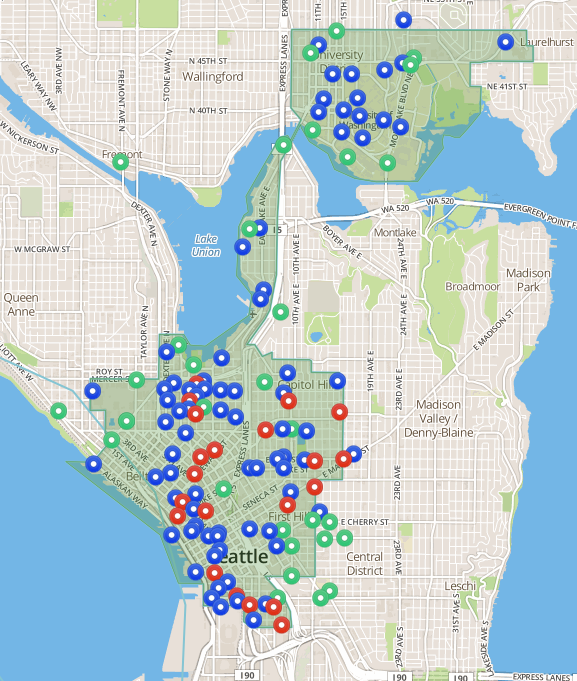 Group Health to sponsor 15 of the 50 Bike Share stations, mostly in Capitol Hill and SLU. Puyallup looking at how to improve access to Sounder. Access and transportation are the biggest hurdles for the Seattle Arena. 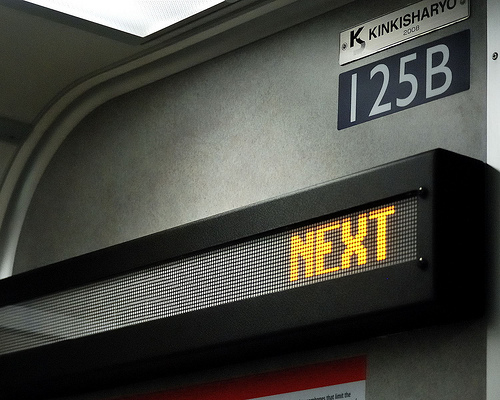 49ers fans seeing red over the interior color scheme of SF’s new BART trains. Take a few minutes out of your day to talk, call, text, or email your close friends, family and co-workers to vote Yes on Prop 1. Tell them why you’re voting yes, often people just need a little encouragement, especially for special elections. Here is why we’re voting yes. Take to your social media to get out the vote. 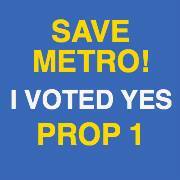 Change your Facebook profile, invite your friends to vote yes and tweet why you voted #YesOnProp1 to #SaveMetro (we’ll be RTing). Help the campaign make calls. 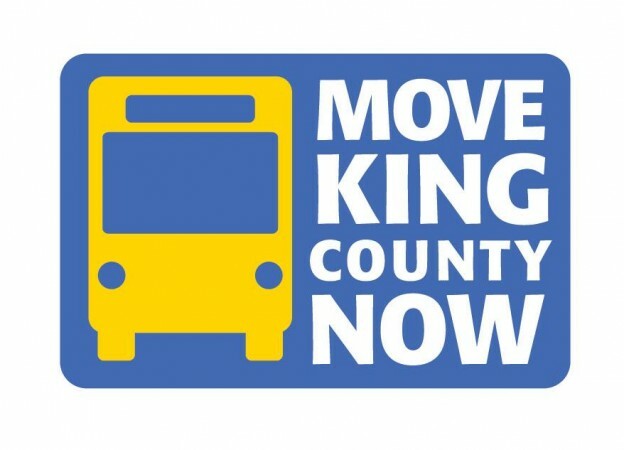 Move King County Now is hosting phone banks all day, with Pizza provided. Tuesday night the Move King County Now campaign will be hosting an election night party at Kells Irish Restaurants & Pub (1916 Post Alley starting at 7 PM). Bell Street Park opens. Success likely depends on business and residents actually using the park. An agile SDOT installs a two-way cycle track on NE 40th in the U-District as part of the Burke Gilman Trail construction detour. Car2Go mixing up how people travel in Seattle. More data needed to fully understand the implications. Capitol Hill Champion schedules a meeting with developer. Why mixed use buildings, specifically in Capitol Hill, look how they do. Senate Majority Coalition Leader Rodney Tom drops out of his re-election bid. Huge news for state democrats. Agitation over a U-Distrct Station plaza continues. Martin pretty convincingly argues why this idea lacks merit. After two years of planning, Seattle City Council unanimously approves the updated Bicycle Master Plan. A huge win for the 8-80 bicycling crowed, i.e. most of us. Metro bus driver threatened with gun, two youth arrested. Metro’s “In Motion” program, which targets small, every-day changes in travel behavior is profiled by Atlantic Cities. 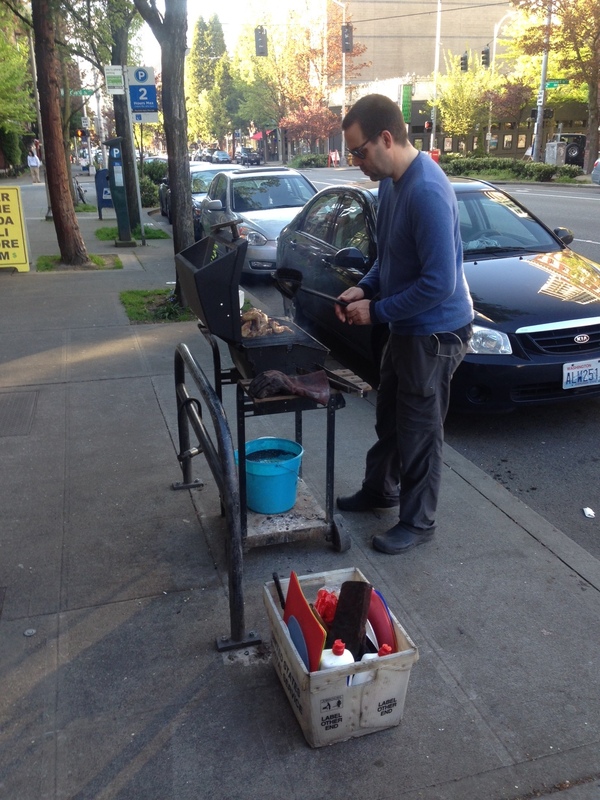 A user experience designer reviews potential replacements for SDOT on-street parking meters. Community Transit adding service, revising and renumber existing service. How to use the American Community Survey correctly. 800 people per square mile is the tipping point between republican and democratic areas. Denser living inherently requires pooled resources and oversight, i.e. government or bodies like HOAs. Report finds that people in dense areas are more economically mobile, healthier and live longer. Sounds like the triple bottom line of sustainability to me. Seattle needs more sitting places… and it’s getting a few more. April 3, 2014 – In preparation for its 2014 launch, Puget Sound Bike Share announced today that it will be moving forward with world-class partners Alta Bicycle Share and 8D Technologies to provide bike share station hardware, software and operational solutions. 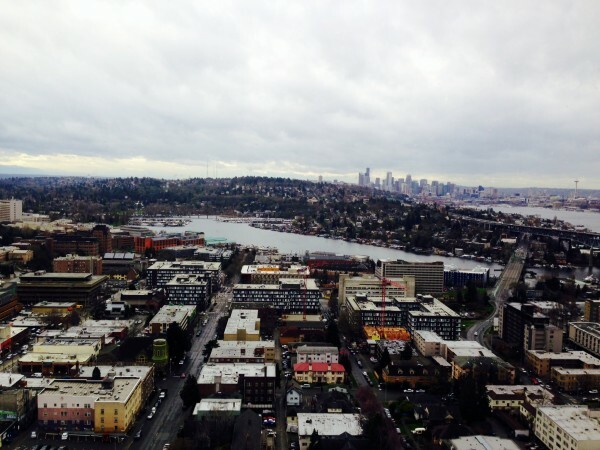 Seattle apartment analysis from my favorite nerds at Dupre+Scott. A must watch video stream for those who appreciate dry humor on technical topics. An excellent and perfectly wonky story about the economics of bikeshare systems. The dire transit situation in Pierce County. Bellevue Chamber of Commerce opposes Prop 1, illustrating exactly why Prop 1 needs to pass. County Councilmember Larry Phillips on why you should vote yes on Prop 1. Sound Transit collecting public comments on U Link pictograms. I understand the purpose but won’t this get unwieldy as ST2 gets built out? Annapurna Café announces the five winners of a U Link tour. Congrats to the winners! 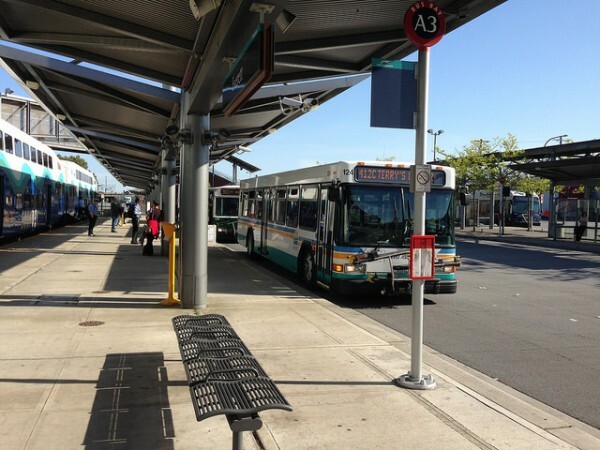 How should High Capacity Transit get to Everett? Comparison between East Link and TriMet’s Orange Line. Two smart phone trip planning apps (Ototo, Transit App) both of which include walking time! New citywide development trends, neighborhood Class A commercial office space and curated, “market hall” retail space (Capitol Hill, SLU). Agenda for this Saturday’s Seattle Neighborhood Summit released. I’d rank this as the most important public meeting this month. Bertha repairs “tentatively” schedule to finish by September over one year since it started. PSRC looking for participants to help update its 2006 household travel survey. Sound Transit to buy 5 double-decker buses for routes operated by Community Transit. 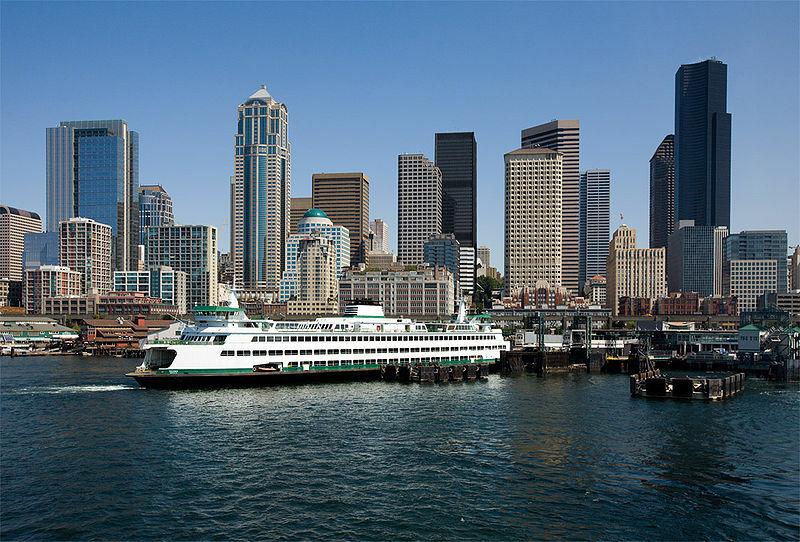 Washington State Ferries looking for a new leader, many challenges to come. Seattle Tunnel Partners will make changes to meet WSDOT contracting requirements for minority and women owned business. Advisory committee recommends new Tacoma Amtrak station at east end of Freighthouse Square. NYC building massive Hudson Yards “overtrack” development, Seattle’s DPD recently looked at overtrack development opportunities (p.44) south of King Street Station. Seattle’s comprehensive plan update, Seattle 2035, is getting rolling. Three directions proposed, but some feel they lack vision. To me they feel very PSRC. Background info here. SDOT issues a clarification about changes to Alaskan Way Viaduct traffic count locations which had originally prompted a sightline post. Lean urbanism: a fancy name for tactical, cheap interventions that make better people places… like parklets. City announces 10 new parklet locations for 2014 based on success of the first parklet outside Montana (my favorite bar btw). King County Metro is looking for undergraduate and graduate interns. Go here and search for “intern”. Wonder why the 3rd and Pike bus stop is closing for construction? This is why. In 24 out of the 25 largest metro areas the median income household can no longer afford the average new car. 15 different methods to protect bicycle facilities including their pros/cons and cost. New ‘bikeology‘ curriculum for 6-12 graders fills common gap in bicycle education for junior high and high school age teens. Charles Montgomery describes his concept of the ‘Happy City’ in Vancouver, BC. ‘Food desert‘ study for Delridge neighborhood empowers those who are affected to develop implementable solutions. New housing units far outstrips demolished housing units 8 to 1 citywide (2.6 to 1 in Single Family zones, 5 to 1 in Lowrise zones, 15 to 1 Downtown and 18 to 1 in Neighborhood Commercial zones). 2,000 units in four towers proposed on former Seattle Times site in SLU. Parking ratio of 0.85 is low, but not that low given the large number of Amazonians that will likely work a stones throw away. Parking study for West Seattle development with all-day frequent bus service but no on-site parking confirms there there is plenty of on-street parking available. Council unanimously passes ridesharing compromise legislation. 80% of NYC’s taxi rides could have been shared. Senate Transportation Committee co-chairs no longer see eye to eye. Philly speed senors trigger red light. I’m curious to see if it works. Win a free Rectangular Rapid Flashing Beacon (RRFB)! Video of one shared Muni/Google bus stop in SF. My first impression, I didn’t realize so many people used the Google buses. For those of us who live or work on the Eastside, it can be hard to get to after work events in Seattle. Luckily, Fuse Washington will be hosting two Move King County Now fundraiser in Bellevue and Redmond on March 24th and April 7th. The April 22nd special election is fast approaching and your financial contribution and/or boots on the ground are key to passing Proposition 1. Maintaining existing bus service is critical and if Proposition 1 fails the Eastside will see significant and painful cuts in transit service. I encourage STB readers to go and bring a friend or coworker along. On a personal note, I’d like to add that the Bellevue Brewing Company’s beer and food makes up for its harder to reach location. Cheers!